The frilled dragon is one of the most fascinating species of lizard due to its neck flaps. When frightened, the lizard will open the neck flaps, revealing beautiful colors that are meant to frighten predators. Similar in look to the dilophosaurus seen in “Jurassic Park,” the frilled dragon can be a temperamental breed that makes an interesting pet for those looking for something unique. Native to Australia, the frilled dragon is well-known for its unique approach to predators. Though it rarely comes down from the trees, it does occasionally come down to feast on insects or other lizards. If approached by a predator, the frilled dragon will stand on its hind legs, open the skin flaps around its neck, open its mouth and run at the predator. If the dragon is unsuccessful at scaring away the predator, it will scurry up a tree for protection. 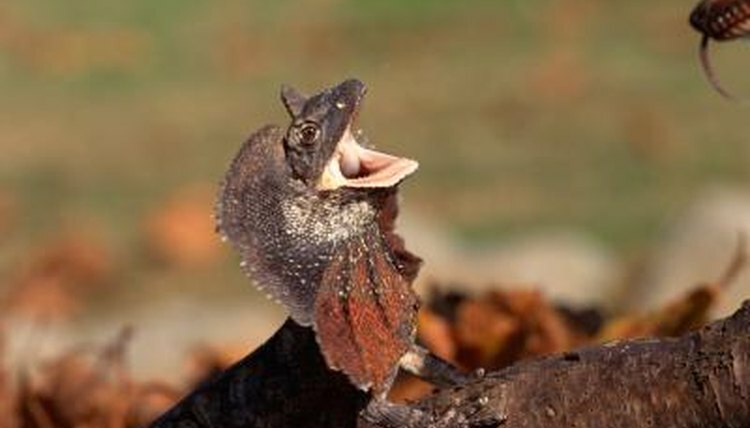 The frilled dragon can be found in Northern Australia in the savanna and woodland areas. The frilled dragon can grow up to 3 feet long, but weighs a mere 1.1 pounds. The coloring varies, depending on the area in which the reptile lives, but is usually a greyish-brown color. With the ability to live up to 20 years, the dragon uses its frill for both protection and as a means of cooling itself. The frill is a thin fold of skin that rests on the dragon's back until needed. Breeding can result in 8 to 23 eggs and the hatchlings are fully independent and able to hunt and use their frill immediately. Frilled dragons are docile creatures that aren't normally aggressive toward humans. However, these aren't the type of lizard that enjoy being handled. Frilled dragons can be high-strung, which means they aren't likely to sit in your lap for long periods of time. Instead, they may take off at any minute and run as fast as possible. In other words, while frilled dragons are unlikely to bite humans, they are best-suited for watching in their habitat than handling. Frilled dragons rarely open their frills when kept as pets. Frilled dragons require a vertical habitat that is a minimum of 4 feet high by 3 feet wide. Substrate can be newspaper, paper towels, reptile carpeting, sterile soil or cypress mulch. The basking zone should be kept at 100 degrees with a cooler area of 70 to 80 degrees. A full-spectrum light should be provided for both UVA and UVB lighting. Food sources include crickets, superworms and silkworms. You can provide greens, but not all frilled dragons will eat them. What Types of Lizards Don't Bite? What Does It Mean When Your Water Dragon Has Its Arm Waving at You?